Love crab cakes? Love Risotto? With this delicious dish, you can have your cake and eat it too! If there’s one thing me and my crew love, it’s seafood. Nary a week goes by that we don’t have some kind of delicious dish from the big blue. I dreamed up this meal while I was making a fresh batch of stock out of some lobster shells I saved. Funny thing about making that stuff, it never seems to last very long. It really is that good. One thing I always tend to crave after making it is risotto. That creamy, slow tender cooked rice that drinks up every drop of liquid you put in is the perfect thing to show off a beautiful homemade sea stock. When you’re constantly thinking, cooking and writing (and dreaming) about food, the search for the next great recipe is always in the forefront of your mind. Sometimes, a recipe is born out of old favorites. Getting the scrumptious flavor of crab cakes into a comforting bowl of risotto was exactly the kind of thing that was bound to happen. A little bit of bell pepper, some onion, celery and typical crab cake seasonings such as old bay, Worcestershire, lemon and a touch of white wine give great base to get everything going. Saute every thing until soft, add the risotto and toast for a minute or so. Add the seasonings and then incorporate the stock, one ladle at a time, allowing it to absorb between additions. For the crab, some freshly picked would be best but they do sell these perfectly acceptable cans of crab meat which actually make it easier when you’re using a lot. I put half the crab meat in the risotto. For the crispy factor, because I like a touch more texture, the other half of the crab meat is mixed with a little egg, panko, seasoned with salt and pepper and seared in hot oil for a few minutes. The thing I liked best in this dish is that there’s no worries about crab cake inner sogginess, which can happen if you make your cakes too thick and cook them at too low a temp. 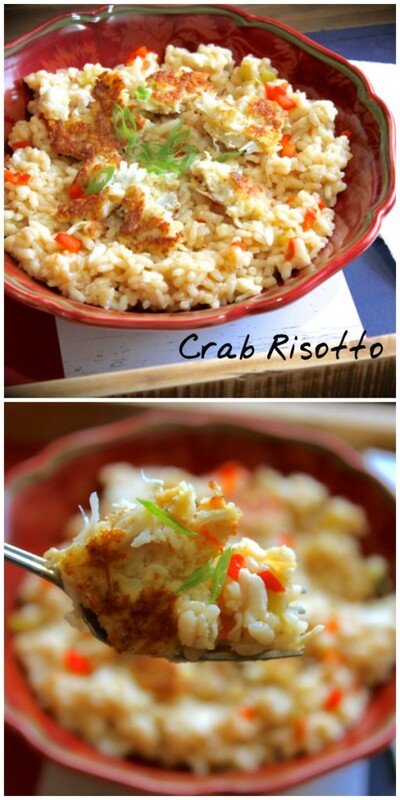 Since the crab pieces are throughout the risotto and a little bit of crispy browned crab is laid on top, it’s a good bite, every bite. If presented on a menu, I would definitely order this one. Even better, it’s in the keeper recipe files here at home. I’m pretty sure when you give this crab risotto a try, it’s gonna make you smile, too. Have a beautiful day and as always, keep it delicious! Place the sea stock in a medium sauce pan over med/low heat. In a large skillet, heat the olive oil and butter over med/hi. Add the onion, peppers and celery. Add the risotto and toast lightly for a minute or so. Add the old bay seasoning, lemon juice and white wine. Stir until the liquid is absorbed. Add one ladle of the stock and stir until absorbed. Repeat until all the stock is incorporated. Turn the heat off and stir in half of the crab meat. Combine the rest of the crab meat in a small bowl with the egg and panko. Place another skillet over high heat and add the oil. Make small (1 oz) patties with the crab mixture and fry in the oil until browned on both sides. Dish out the risotto mixture and top each serving with a crab patty. Garnish with freshly chopped chives. Thank you so much for stopping by. I hope you enjoy your visit! Watch my cooking videos. Just click my youtube button. Shop in My Amazon Store! Some of the links on this page, other pages and within posts at Happy Belly Foodie may be “affiliate links.” This means if you click on the link and purchase an item, I will receive a small commission at no extra cost to you. This allows me to bring you more great recipes and content. Thank you for supporting Happy Belly Foodie!